Showing results by author "Vice President Al Gore"
In the second presidential debate of Campaign 2000 between Vice President Al Gore and Governor George W. Bush, the candidates, clearly using more caution than in their first debate, stated their positions on such issues as foreign policy, racial profiling, and the environment. The debate took place at Wake Forest University in Winston-Salem, NC on October 11 with Jim Lehrer as moderator. If you missed the debate, or want to hear it again, audible.com has made this program available for FREE. Listen now before you vote! The first in a series of highly anticipated debates between presidential candidates Vice President Al Gore and Governor George W. Bush took place at the University of Massachusetts on October 3. The VP and the Governor wasted no opportunity to criticize each other on everything from policy to credibility to track records. 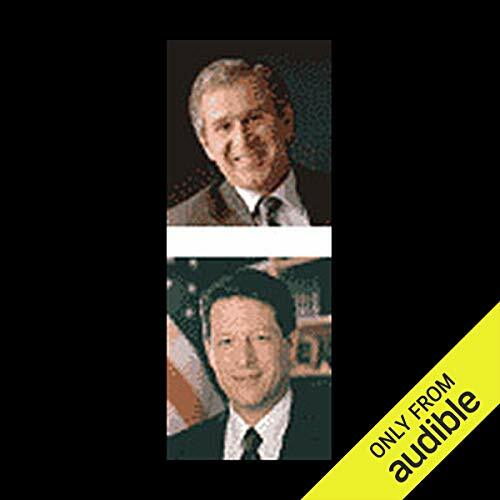 If you missed the debate, or want to hear it again, audible.com has made this program available for FREE. Listen now before you vote! If you missed the debate, or want to hear it again, audible.com has made this program available for FREE. Listen now before you vote!